After posting over the weekend my success with creating the Puto Flan, I received a lot of praise for it and also was asked about the recipe. So I'll be happy to go ahead and share what I used and also the procedure. Excuse me for the lack of photos since I really wasn't planning to post it. But who am I not to share right? My curiosity spurred with the posts of this delicacy in the Facebook Baking group Bake Happy Manila, everyone was almost posting their accomplishments and it was so inspiring. I went ahead and checked online for a recipe and I stumbled upon a YouTube video of a feature by Jessica Soho, then came across the recipe as posted by Heart of Mary's. Happy me, I went ahead and gathered the ingredients and started on my quest. 2. Heat water in you steamer, and then bring to a boil. 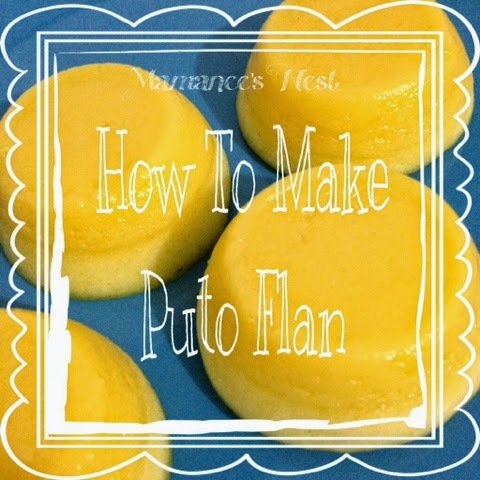 Grease your puto moulds lightly, and fill them with your flan mixture about 1/3 full. You can use sauce dispensers made of plastic to make it easier to distribute your mixture. 3. Steam your flan make sure to wrap your steamer cover with a towel, I kept mine on medium heat and steamed the flan for a good 20 minutes, make sure to check your flan once in a while and see if the flan is almost cooked and no longer in its liquid form, that means it's ready. Set aside. 4. Create your puto mixture. Sift your dry ingredients together. add your wet ingredients and mix, but do not OVERMIX. If you have another plastic dispenser, transfer your mixture. 5. add your puto mixture over your flan mixture and steam again for around 15 minutes. Or until it has risen and shows a shiny dome. 6. Allow them to cool down before your remove them from the moulds to make sure that the flan and the puto stick together. Use a knife to loosen the puto from the mould and tap slightly to release. Puto Flan for your heart's delight! Looks yum and easy (sana easy?!). :D Will try this soon. Naku Kim, as long as you like cooking it's easy hehe. Looks so good! 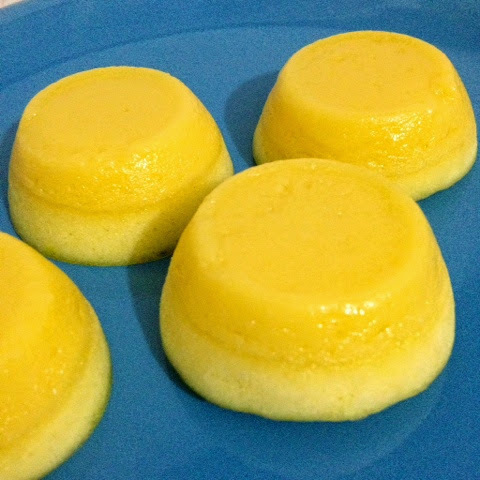 I have tried making leche flan before but never puto flan. And looks like you did a great job mommy! You have to try this Jhanis! Imagine you get to use the egg whites left over from your leche flan mixture! from the ingredients above how many puto can be made? Wanting to make some :-P, Can I ask, from the ingredients above how many puto can be made? Hello Eiman! Nice to have you here! Mamanee, I tried it na! Super yummy! I'm glad you were able to try it! share your post please! Hi Belekoy, I'm sorry to hear that it didn't come out as well as you wished. Were you able to add the baking powder? That ingredient helps it to rise. Also, there could many factors as to why it could have not been soft, if you are using a gas stove try to use a much lower heat and also make sure that the cover of your steamer has towel wrapped around it as to avoid your puto flan getting drops of water on them. Hello SooYana, usually kase yung baking powder ang nakaka pait ng lasa lalu na if hindi bago yung baking powder. Make sure na bago ang Baking powder. Yung sa thickess naman, do you mean dahil siksik sya? Kase itong puto na ito is medyo dense talaga and not light and super fluffy. Dapat yung mixture medyo runny cya if hindi bawasan mo ng konti ang flour. Para kumapit yung puto dapat half cooked pa lang yung flan, and if your are using a gas stove low heat para hindi tumabingi. Note: half cooked yung flan when you add the puto mixture. Given that it has eggs, you can refridgerate it. My timeline with desserts and baked goods is always 3 days maximum if stored properly. How many pieces came out from the recipe? Looks yummy! Hi, your flan should be half cooked when you put in the puto mixture, make sure also that you grease your puto molders before putting in any of the mixture. I use cooking oil most of the time to grease my pans for cakes and puto. 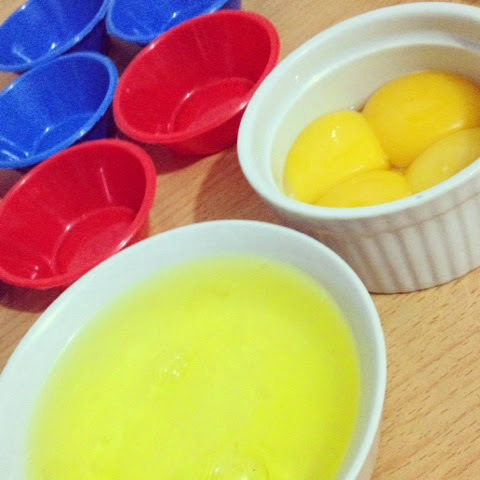 :) You can also use margarine pero expect mo that there will a slight influence sa taste and color ng white puto mismo. My family love the puto flans! It was a hit. Thanks! Hello! Thank you for letting me know! Yehey! Hello Jill, the difference between All-purpose flour and cake flour is the ability for it to rise. Cake flour will rise less and usually would produce a more denser "cake". So, if habol mo is fluffiness, mas ok si APF (all-purpose flour) but if gusto mo yung dense na puto - ok na yung cake flour. :) Hope this helps. Yehey! That is so great to know. :) Thank you so much for trying it out and letting me know. I think thats yummy !! !i will try it later!! I tries it and came out so good! Thanks for sharing. I actually baked it using regular muffin pan greased with butter. My husband and daughter loves it! Wow love that you used butter to grease! Great that it came out great. :) Yehey! mamanee san luis!! thank you sa recipe :) easy lng plang gwin :) my husband as well as my parents, they loved it so much! another kusinachivements nnman :) :* thanks po !! Yehey Mary Jane! Glad that your family loved your cooking! Mamanee.. hello po ask ko lang po kung ilan days ang shelf life ng puto flan? at kung pwede iref ng hnd tmtgas un puto.. I wouldn't store it for long dear. Since it has no preservatives maximum of 1 day in the fridge in an airtight container. Maraming Salamat po sa pag share nang recipe. Ilang beses ko na din po itong naluto it came out perfect. Thank you again and more power. wala na po bang milk for the puto? Honestly have tried using a large molder - but probably a dozen. I tried this recipe 3 times. But it always turn bad. My flan did nt stick to puto. Whats the technique ;? Do not fully cook your flan yet. Before you pour the puto mixture half cook the flan so it will stick. Hello po question po about sa flan.. Normal lang po bah nah yong flan pag masagi is parang nadeform? Hi Mamanee San Luis, I do hope you have time to reply. Does you eggs a larger size or medium? I have tried this and it was a success however, im not really satisfied though all the peps sa hauz ate it all in seconds. I want my puto to be less dense and fluffy , can i use fresh milk instead of Water or maybe 1 cup of water and 1/4 fresh milk? will the outcome of the puto be less dense and fluffy? Thank you so much. please help me. For a lighter fluffy puto, try to use cake flour vs. APF. You can try to substitute milk, although I have not honestly tried it yet. Good luck! Hi there, I have not tried using milk in replacement of water, so it might change the consistency of the puto.